Enjoy The First Two Chapters FREE! Once you start you won't stop. A great mystery with all the angles and twists. Just when you think you have it figured out something new pops up. Intelligently written with all loose ends wrapped up. A must read. Malicious Intent is an Exciting Ride! This book got my attention from the first page and I could hardly put it down! Sam Parker is a character that will remind you of either yourself or someone you know and love! The characters are all so interesting and seem so real. But it's the plot that keeps you turning pages. 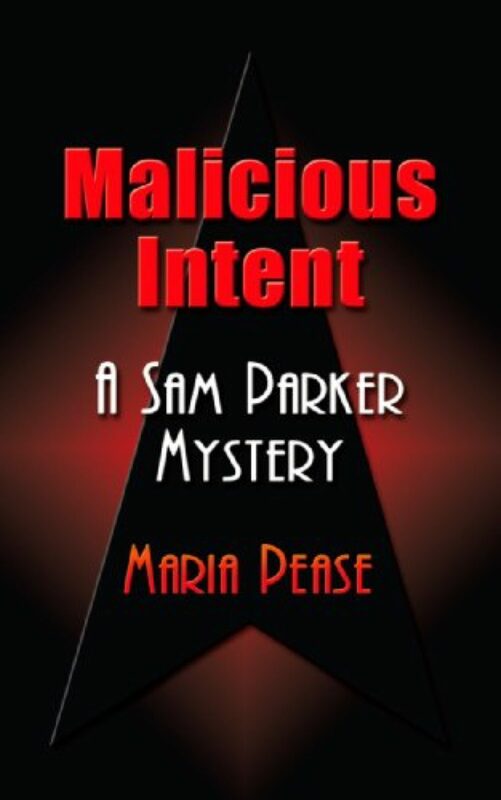 If you like a good mystery, with a couple of laughs included, you will love Maria Pease's Malicious Intent too! Fabulous fast-paced murder mystery! I was hooked and entertained from page one. I loved the character of Samantha Parker and am anxiously awaiting her next novel. Malicious Intent is funny, exciting and a must read to all. I loved it, you will too! The background check on Ronald Gregory proves that he has been in trouble with the law before. Upon discovering this, Sam seriously considers telling him to take his money and get lost, but she has two problems. The first is that she’s broke and on the verge of eviction by her cranky old landlord, Mrs. Bennett. The second reason, which is equally important, is that she is extremely attracted to this hunk. On the other hand, she also finds it all very suspicious that he came to her when he could have easily gone to a professional investigator. That thought alone won’t release itself from her brain, but she wants answers and is determined to get them. In order to get a handle on Ronald, Sam decides to follow him for a while. It is during this time that she observes that he hangs out with some pretty shady characters. When Sam asks him about them, he tells her that they are like family and have always been there for each other, until now. He explains to her that his “friends” are involved in drug dealing, money laundering, robbery and murder. Although he is not happy about the arrangement, they are still his friends so he continues to allow them to use his business to hide their criminal activities. They know he no longer wants to be involved in their dealings, and their relationship has become strained to say the least. As time goes on, Ronald senses he is being ousted. He knows what they are capable of and becomes convinced they are plotting a way to kill him and take over his business. But he is determined to take them down before they have a chance, and wants Sam to help. When Sam doesn’t hear from him again, she can’t understand why and decides to take things into her own hands and goes out looking. That’s when the search takes a turn from finding out who is following Ronald, to finding Ronald himself. She just never imagined it would lead her to the mob, murder and into the arms of the crime boss himself.